A forested mountain range in northwestern New Mexico that stretches southeast from Gallup to southwest of Grants. Mount Sedgwick, at an elevation of 9,256 feet, is the highest point in the range. 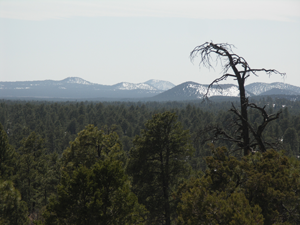 The Navajo names for the Zuni Mountains are Naasht’ézhí Dził (Charcoal-Streaked Enemy Mountains) and Ńdíshchííʼ Ląʼí (Many Pines). "Ciboal National Forest, which includes the Zuni Mountains, April 4, 2010" by tochichi is licensed under CC BY-SA. 1995 Navajo Place Names. Guilford: Jeffrey Norton Publishers.